Not much time for blogging and blog hopping now a days. Friends i am moving back to India forever on this Weekend, so since past few days i have been really busy doing packing and other things. 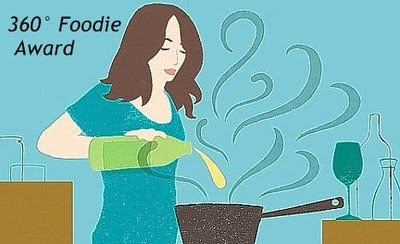 Priya ,vidhas ,Ramya, Shama, Adlak ,Arundhuti has passed me the “360 degree foodie award”.Thank you so much for passing it to me. 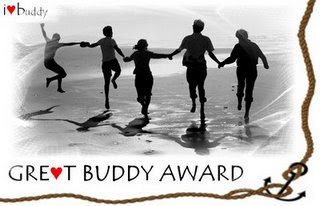 Yasmeen ,Ramya ,Arundhuti has shared with me “ Great Buddy Award”. Thanks a lot all for the wonderful award. 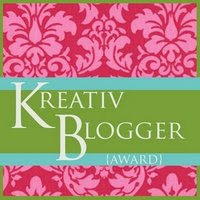 Vidhas ,Jaishree , Ramya , Arundhuti has passed me the “Kreative Blogger Award”.Thanks You all for such a wonderful award. Priya ,Ramya ,Shama ,Arundhuti has shared with me “Yumm Yumm Blog Award”.Thank you all very much. Andhra Flavors has shared with me " Perfect Blend of Friendship Award".Thanks a lot Andhra Flavors.Will cherish Your friendship forever. Jaishree has shared with me Hard Working Blogger Award ,Good Job Award, Inspiration Award ,Butterfly Award.Thanks a ton Jaishree .They mean a lot to me. vidhas,Ramya ,Shama,Arundhuti,Adlak,Yasmeen tagged me with the 7 Meme. Thank you so much Girls.I enjoyed doing this meme. Enjoyed my time with family and friends. Worked for one year before my daughter was born. Visited beautiful countries like Switzerland ,Belgium and Amsterdam with my hubby and daughter. Chatting with family in India. Travel to all interesting places. I would love to pass all awards and tag to all my blogger friends who visit Mom's Recipies regularly and give me encouraging comments. Good to see you back in action Sireesha. Congrats on your awards and it was good reading your meme. I was wondering what happened to you. Wish a safe move once settled come back :) Congrats on ur awards! Congragulations with all the awards. india lo ekkada? Its a great news. india tirigi velleka akkada elaa adjust ayyoro cheppandi tappanisarigaa. All the best for a wonderful future in India..congrats on the awards..
Congrats on the awards Sireesha! wishing you a happy move! Take care!